Like many people, I started off with a couple of years of unremitting rejection before going on to be published. These days, even with an agent, and lots of books behind me, I have around a 3 in 4 failure rate for getting picture book stories published, so I can claim to be experienced. If I send a story to my agent and she just comments ‘that’s very sweet,’ I know it’s doomed from the start. The stories my agent likes enough to send on to an editor sometimes go on to be accepted, but they’re frequently rejected at various stages in the publishing process. It’s disappointing when an editor loves a story but can’t get it past marketing - and it’s most disappointing when ‘low sales projections’ mean the project is ditched after contracts are signed and colour artwork is in (something that has only happened to me once, I’m pleased to say). One of the advantages of having an agent is that a gentle’ no’ filters back to me – often leavened with humour. 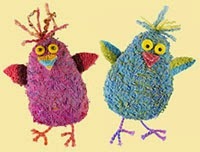 I couldn’t help a wry smile when the news of the rejection of a story called Chirpy Chicks came to me in an email entitled ‘not so chirpy chicks’. These days, I take rejection philosophically (after all, nobody got hurt or died) and by the time I hear that my agent has done all she can for a particular story, I’ve already moved on to other ideas. And I prefer to think positively – a 3 in 4 failure rate is a 1 in 4 success rate. YAY! Do you have a favourite reason for being rejected? Our guest blogger this month is writer, designer, packager and publisher Tony Potter, of iSeek Creative. 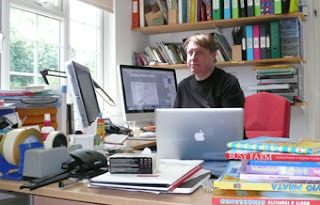 Tony worked in-house for Usborne and Collins before setting up his own packaging company in the late 1980s when the world was a happier place, books were easier to sell, but a darn sight harder to create without the benefit of InDesign, Photoshop, scanners that cost less than a quarter of a million pounds, DIY typesetting and instant communication. He specialises in creating unusual and innovative children’s books, and has links with publishers worldwide. He has a several nom de plumes. When people ask what I do, I usually say that I make books and that I run a book packaging company. This usually leads to confusion right away, as people think I'm a bookbinder and packer. When I then explain that I create books, the response is usually "Oh, I've always wanted to write a children's book," or "my aunt / best friend, Mum, sister, etc., has written a children's book - can they send it to you to publish?" We don't publish anything right now, but we do create and sell a lot of books - perhaps 50 titles a year to clients around the world and we let them get on with the exciting but unpredictable job of holding stock and publishing into their own market - one which they understand and know much better than we do. Right now, our best markets are Brazil, France, USA and Canada. Our worst market is the UK, but that's perhaps the subject of another blog. Nearly everything we create begins life in-house. I create books every day of the week (and often half the night too!). I conceptualise books and formats, write, design, do paper engineering and occasionally illustrate - one way or another I bash a project into shape from an idea to a printed book. My work also involves art directing illustrators and freelance designers, briefing editors and commissioning text. 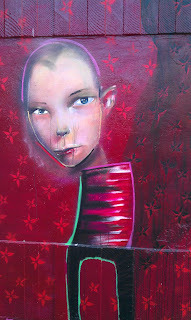 The best writers, for our projects, are those that can write visually to a brief. Occasionally, but very rarely, someone sends us a manuscript for a picture book or an idea that gets us excited. The mission is to make books that are compelling, that are good quality, have high production values and which have the potential to sell in as many international markets as possible. Every book we create has to be pre-sold before we print it, so a lot of time is spent making prototypes and proofed dummies that can be shown to publishers and other clients who may be interested in joining a print run. Creating books that work editorially and stylistically in many markets isn’t easy. 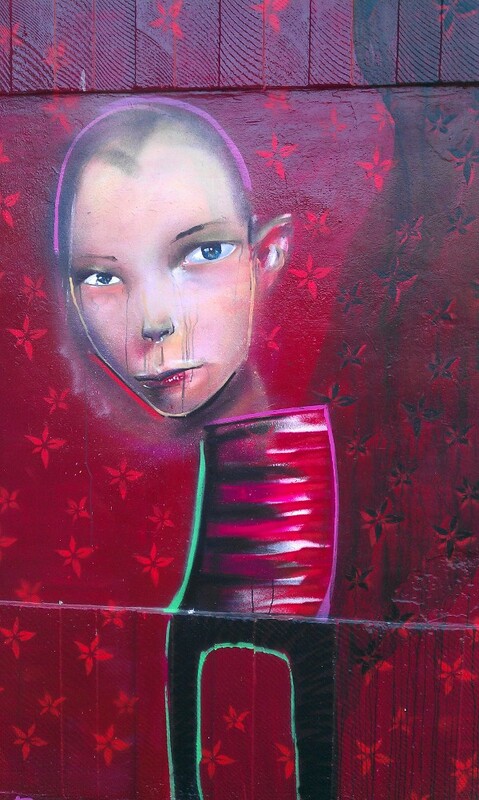 What works in Germany invariably doesn’t work in France, where the aesthetic is very different. Books that are loved in Spain often work well in Brazil, but what’s great for a book club in America is often impossible to sell anywhere else, and so on. In the end, a great idea is a great idea, but even the best ideas are more or less successful in different places and often at different times. 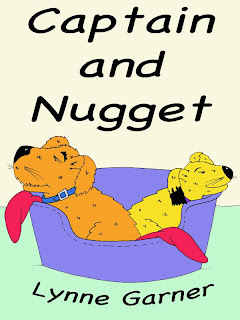 All of our books are illustrated and a few are conventional 32pp picture books. We spend a lot of time worrying about the aesthetic direction to take with a new idea and this is often dictated either by the idea itself (as in, this pop up would work really well, but only if it’s illustrated with, say, a very French aesthetic), or by a specific client or group of clients we have in mind (as in, there’s no way that bookclub X will ever buy this activity book unless we make it a certain way). So although we’re creating books with the whole world in mind, in reality we tend to create books that we think will appeal to certain markets and particular clients. The mission remains the same regardless and sometimes we’re surprised. An idea that last year sold in, say, Italy and Australia, but nowhere else, suddenly becomes popular for reasons that we often can’t discern. Choosing illustrators for a book has never been easier, or harder at the same time. We work with illustrators around the world and this has opened up the possibilities of exposure to very different aesthetics and styles for books that might not have been so possible even 10 years ago. It makes life much harder for UK illustrators, of course, as they are competing for work with the rest of the world, but the important thing for me is to choose the right person for the job. It’s been a varied week this week: I’ve been making pop-ups for Brazil, working on picture books for Australia, activity books for America and secret new ideas for the Frankfurt book fair. The one thing I know for sure is that although there’s more of the same for next week, there are a hundred ideas waiting to be thought about, developed and conceptualised and every one of them will be a surprise until it’s bashed into shape, finished and in a shipping container on the way to somewhere! What Story Do You Think You're Writing? 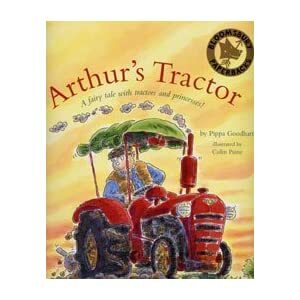 I began writing the story that became 'Arthur's Tractor' with a simple aim; to capture some of the fun of mechanical sounds that I remembered from The Little Red Engine stories (by Diana Ross and Leslie Wood) of my own early childhood. I couldn't have told you what happened in the stories, but I did remember the joy of those repeated 'CHUFFA CHUFF' train noises, and the 'WHOOEEE'﻿ whenever anything exciting happened. Funnily enough I came across 'The Little Red Engine Goes To Market' deep in a box of dusty books just yesterday as I was unpacking them onto the shelves in our new house. There are other sounds in the book which I hadn't remembered - 'And it drew up at at the platform SHUUUH'. Going uphill made the engine go HUTCHA BA HUTCHA BA HUTCHA BA BAAAA'. And there are animal noises too. What there isn't is much of a story; simply a journey recorded, animals collected and taken to market, and then home to the shed/bed. 'Arthur's tractor ploughed up and down, turning green to brown. And before long we've got an 'Eeeek!' that makes Arthur stop his tractor, turn off his engine and get down from his cab. He stands for a while, and he scratches his head, then he siad, 'That must be the sprocket spring sprigget needing a twist and an oil', so he twists and oils, and gets back on his chugga thrum way before another sound repeats the process. The much more DRAMATIC story is happening behind Arthur's back, unnoticed by him. The 'Eeek!' is actually coming from a princess being faced with a dragon. Then the 'THUD THUD THUD' comes from a prince arriving on a horse, etc. The fun, I hope, for a child is in knowing what the narrator, and Arthur, apparently don't know, because, of course, even very young children can 'read' pictures. Arthur's and the fairy tale stories come together at the end when Arthur's plough blade breaks. Arthur then uses the prince's sword, welded with dragon breath, to mend the blade. And this is where the question of 'what story do you think you're writing?' comes in. It was only some time after the story was written, and when it was on it's way to publication, that it dawned on me (duh!) that what I'd done in this story was to literally turn a sword into a plough share. Clearly that Biblical message towards peace rather than war was imbedded in me, and had come out in literal form. This is the only one of my stories to end with the cliche of 'they all lived happily ever after'; a nod to the fairytale ingredients I'd used, but also because the characters have now all paired-up into happy friendships. They've achieved peace. But something else was going on subconsciously too because, at the end, Arthur makes friends with the princess who is called Edith. Arthur and Edith were the names of my paternal grandparents who I never knew. Of course I was aware of that as I used the names, but I hadn't consciously made the link with their son, my father. My father was a man who worked in a very practical way to bring peace rather than war to the world. He became the President of the International Court of Justice in the Hague; an institution which few are aware of (it's nothing to do with the International Criminal Court), where boundary disputes are considered and resolved, bringing peaceful solutions to such problems. And that is why I dedicated 'Arthur's Tractor' book to my father. So a story intended to simply enjoy some mechanical sounds, along with a bit of visual trickery, wrote itself into being, if you like, a book about peaceful resolution to conflict. That surprises me! Have any of you found stories writing themselves into something different from the story you thought you were writing? Question 1: Why should we write? Answer 1: Because we must. Question 2: But why must we? For most writers across the world it's flying in the face of economic necessity to spend time on writing. Question 3: So why keep going in the face of hours of commitment that may end in a rejection? I refer you back to Answer 1.
to paint this street furniture, then disappeared? If we write picturebook texts and they move from the realm of our personal computer or notepad to the public realm of a printed book or eBook or app etc, our ideas and the way they're expressed have the potential to be remembered. They can get people thinking and talking and can provide the foundations for so much more. If you are fortunate to have had one book published you'll know the thrill of either seeing it discovered by a 'new' reader or re-discovered by an 'old' reader. Four year-old Girl: What do you do? Me: I write books, including for children. Four year-old Girl: [Long pause, looking round at her classmates]: We're children. Four year-old Girl: Have I read any of your books? [Visiting Author scans the classroom, and seeing two healthy-sized wooden boxes of picturebooks, walks over with a mixture of trepidation and hope. Four year-old Girl watches Visiting Author with that question hanging in the air. Me: I wrote this book. PICTURE ANOTHER SCENE A close friend I met in publishing leaves to qualify as a teacher and build a school in a remote part of Ghana with an inspirational Ghanaian woman. Literally build it, cement scooped into the boot of the Head's car to avoid it being syphoned off overnight before water can be added and bricks can be stuck together to make some walls. Whilst over in Scotland my friend volunteers at a local primary school helping children who have additional needs, often due to their family circumstances. Seven year-old Boy: [Looks askance at Volunteer Teacher] I don't believe you. Volunteer Teacher, friend, and biased-towards-me person: Which is your favourite out of those five? Seven year-old Boy: This one. All writers have stories about how their words and ideas get people thinking and talking. Whether shared or not, these experiences bring sporadic energy to the ongoing labour of writing. Many authors are strapped for cash and finding it increasingly hard to make a living out of their art, due to fewer offers, lower advances and unsettled routes to market. But this is also a time of opportunity. Writers need to survive for new writing to happen. I write because I have to, but it isn't just about me. Many children who are keen to read our books can't even get to school. If they can get to school and the schools are good ones, our books can make a difference. Question 4: What can we do to reach readers? Answer 4: We can write. There's a story or two you might like to read on this website. If you look deep enough you will find the foundations. 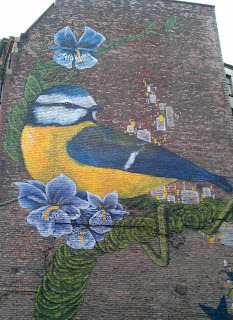 an enormous bird perches; cement supports the painting's base. When I first started writing I was advised to write about what I knew. This was why I started writing non-fiction. But I'd always wanted to write fiction, I didn't know where to start. So I found myself still writing about what I knew. 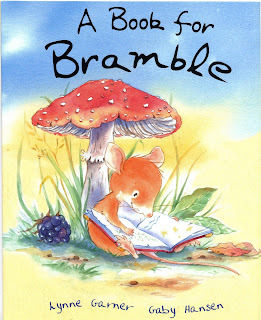 For example my first picture book A Book For Bramble was based on my work rescuing hedgehogs (if interested check out my hedgehog blog: The Hedgehog Shed). Today I still find myself writing books based on what I know. 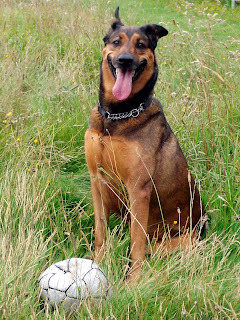 For example my latest picture eBook Captain and Nugget (Amazon UK or Amazon US) uses many of my experiences with the dogs I've been lucky enough to share my life with. For example not wanting to go for a walk is based upon our previous dog Jodi. Who in old age would be happy just walking around the car parked on the drive. Great when it was cold and miserable but when the sun was shining I'd often want to go a little further. But it was her walk so she was in charge. Jodi's passion for stealing underwear, especially socks (clean and dirty) appears in my picture book app Puppy, Why Do I Love You? 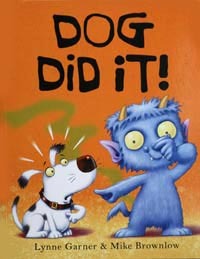 My picture book Dog Did It was inspired by all my dogs and their habit of embarrassing you in front of company. When we are forced to utter those words, "sorry that wasn't me. The dog did it!" However I'm pleased to announce I feel I may be growing as an author. 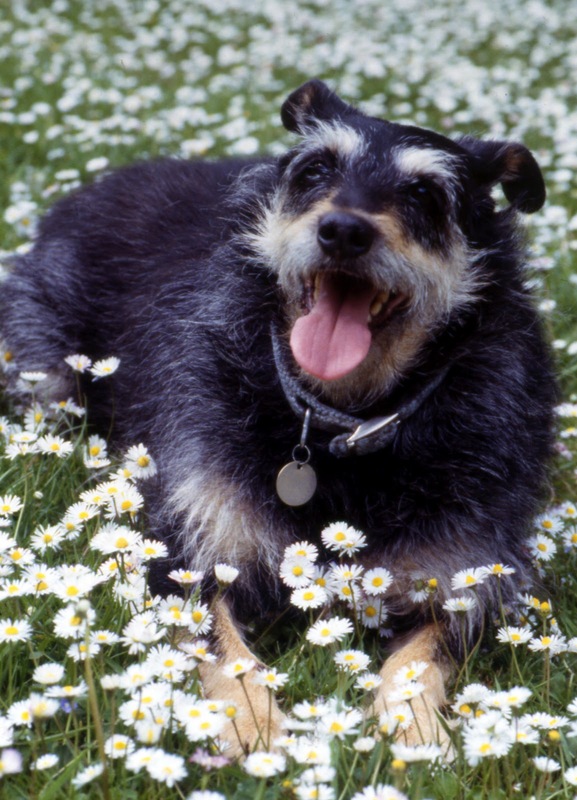 Because the story I'm working on at the moment does include a dog but it doesn't draw on previous knowledge or experience. You see it features a ghost dog and I've never experienced that! To end this post I just want to ask what experiences have you used in your books? Go on spill the beans, I'd love to know. My friends think the drinks are on me. My ex-husband's lawyers claim I must be sitting on a secret fortune. And schools just can't understand why I should charge for doing book readings or running writing workshops. Where does this myth come from? JK Rowling? Media quotes of 'six figure advances'? 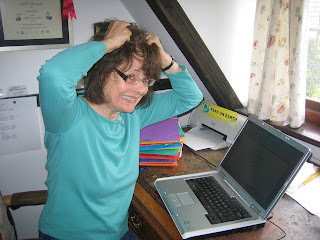 The reality of an author's life is very, very different. Most authors I know have day jobs or spouses to supplement their income. I work three and a half days a week to allow me to write and if I tried to live on my writing income alone I would starve. The truth is that this year I technically made a tax loss. How? Well, when a book sells for £5.99 we authors don't get £5.99. No siree. We probably get around 20 pence. Yep. 20 whole pence. And when my book is read on Cbeebies I get the princely sum of…wait for it…£9.82. To offset these riches I have a lot of expenses: I work at home so there is my electricity and heating, my stationary, my stamps, my travel and my laptop. Even if a book sells relatively well all of these factors can easily combine to result in a tax loss. On top of being modestly paid, writing is a notoriously fragile industry. One year a publisher may love your quirky style, another year you may find your voice 'doesn't fit' with their list. And we have all heard the horror stories of having a book lined up, agreed and ready to go, only to have it pulled at the last minute. Or the book that was due out in 2011 but was pushed back to 2015 to fit in with other publications. So no, we don't do this job for the money or the glamour. Personally speaking, I write because I love it. I write because something in me makes me desperate to do it. And I write because children like my books. So when I get a cheque for my public lending right, instead of focusing on the low income, I try to delight in just how many children borrowed my book from their local library and snuggled up with their mum or dad to read it.